This MP3 file is from the album Broadway boogie / Michael Kieran Harvey, [piano]. Duration: 2 mins, 32 sec. Score: Broadway boogie-woogie : for piano / Andrew Ford. 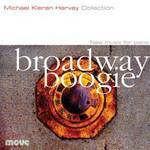 CD: Broadway boogie / Michael Kieran Harvey, [piano].